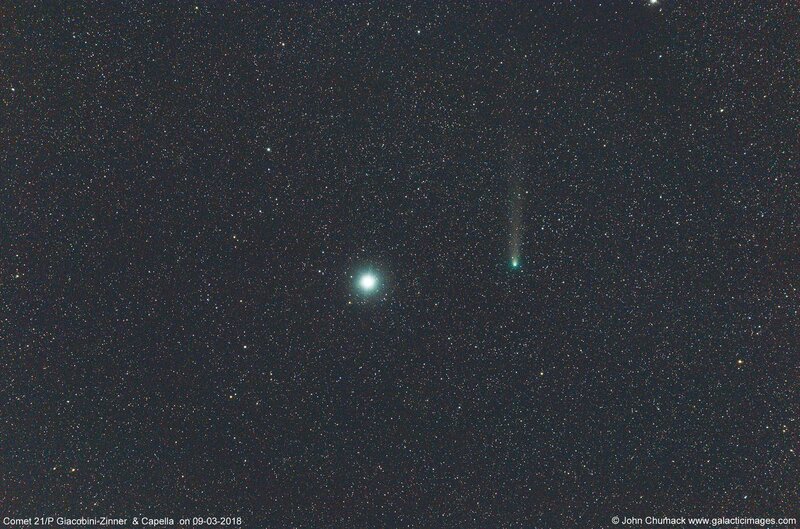 Comet 21/P Giacobini-Zinner wide angle view (blow it up full screen) as it passed by bright star Capella in Auriga on Monday morning..09-03-2018 @ 06:30 to 06:34 U.T. This was awesome to see in binoculars, Ron Sherman and I were viewing this comet in Binoculars last Saturday Night too. Early Monday Morning I captured this image under strong moonlight, but used my dome to block out stray light entering the telephoto lens, while shooting the Comet. I captured this 5 minute image, using my Canon 6D DSLR & a Sigma 150mm to 600mm lens, set to 300mm @F5.6, ISO 1250. The fainter dust tail stretches out roughly 1 to 1.25 degrees of sky.